Despite having their wings clipped this fiscal year by sequestration, the commander of Air Combat Command has selected the officers who will be part of the Thunderbirds 2014 demonstration season, according to release. — Lt. Col. Matthew Bradley, 83rd Fighter Weapons Squadron director of operations from Tyndall Air Force Base, Fla., will be the squadron commander and lead pilot, which is known as Thunderbird No. 1. He will be responsible for commanding a force of more than 100 enlisted service members and 11 commissioned officers assigned to the Thunderbirds, along with leading all demonstration flights. Bradley will replace Lt. Col. Greg Moseley. — Maj. Scott Petz, an F-16 pilot stationed at Nellis AFB, Nev., will be the team’s right-wing pilot, known as Thunderbird No. 3. He will fly as close as 18 inches from the No. 1 jet during flight formations, demonstrating the teamwork and precision of America’s Air Force. Petz will replace Maj. Caroline Jensen. — Capt. Ryan Wick, an F-22 pilot stationed at Langley AFB, Va., will be Thunderbird No. 6, the team’s opposing solo pilot. The solo pilots performs maneuvers that showcase the maximum capabilities of the F-16 aircraft. Capt. Jason Curtis, the current opposing solo pilot, will transition to the lead solo position in 2014, replacing Maj. Blaine Jones. — Capt. Joshua Larsen, an F-16 pilot stationed at Shaw AFB, S.C., will become Thunderbird No. 8, the team’s advance pilot and narrator. He will be responsible for advance work, coordinate logistical details with the local show organizers, and narrate performances. Larsen will replace Maj. Michael Fisher. The team is still reviewing applications for the position of Thunderbird 9, the team’s flight surgeon. An announcement will be made once the selection is finalized. The 12 officer positions on the team are two-year tours of duty, according to the release. Team position openings are staggered to allow the squadron to maintain continuity of experience and leadership. In odd-numbered years, Thunderbird Nos. 2, 4, 7, 10, 11 and 12 are replaced. 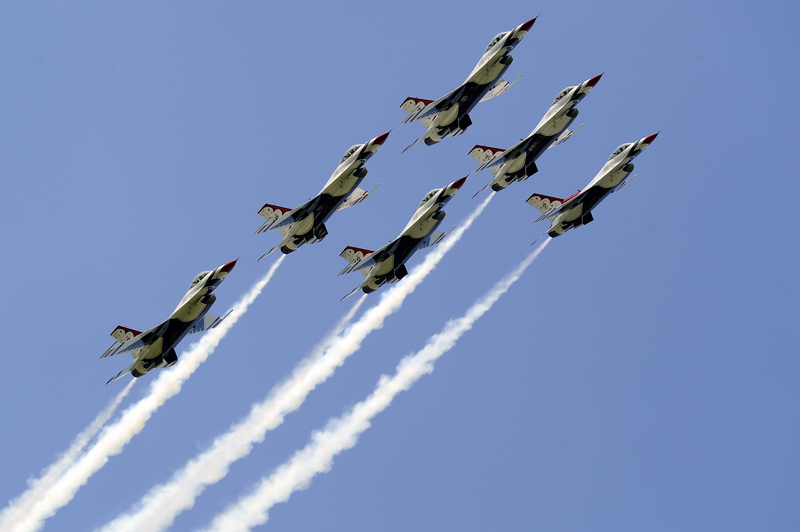 Next year will be the Thunderbirds’ 61st season as the Air Force’s premier jet demonstration team, but whether it will be a flying season remains to be seen. Much of the Thunderbirds 2013 show schedule was cancelled effective April 1 because across-the-board cuts to federal spending known as sequestration. While flying is among the demonstration teams premier activities, airmen are keeping busy speaking at schools and doing other non-flying, community engagement activities, according to Lt. Col. Greg Moseley, current Thunderbird No. 1. I went through Crew-Chief Tech school with Major Petz back in 1997. He was an outstanding F-16 Crew Chief, good person and I am glad to see he fulfilled his dream to be a Falcon Pilot.